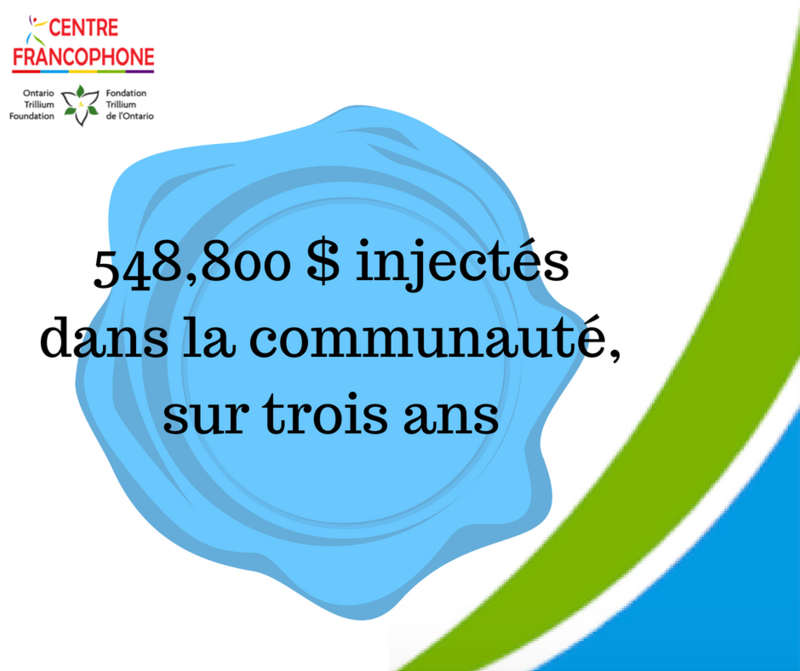 The “Community connections” project has been created by Coopérative du regroupement des organismes francophones de Thunder Bay and is funded by an Ontario Trillium Foundation grant. Linguistically and culturally isolated, Francophones in Northwestern Ontario are particularly exposed to social isolation. The project aims at reducing these three types of isolation among the community. Coopérative ROFTB Inc. recently acquired and renovated a new Francophone Centre in Thunder Bay, which allows for a greater cohesion among French services providers. Moreover, many social groups are now able to restart social activities and programs in French, that had to be put on hold for years because of the lack of appropriate space. Studies have shown that overcoming isolation is beneficial for those affected, their relatives and friends, and the community itself. Over the next three years, thanks to OTF funding, Coopérative ROFTB Inc. will financially support its seven group members as well as other community partners in order to ensure their growth and thus to better serve the most isolated members of the Northwestern Ontario Francophone community. Not only native and/or fluent French speakers can be part of the project. According to the Inclusive Definition of Francophone (IDF) introduced by the Government of Ontario in 2009, Francophones are “persons whose mother tongue is French, plus those whose mother tongue is neither French nor English but have a particular knowledge of French as an Official Language and use French at home.” Today, only 35% of Francophones in Northwestern Ontario use French as their domestic language, which contributes to linguistic insecurity. - And practicing your French with us! Learn more about available programs by contacting Louise Boderé at 888-444-9886 ext. 99 or communication@centrefranco.ca, or by stopping by the Centre. We are open Monday-Friday from 8:30am to 4:30pm. Feel free also to join us during our events and activities! - Joining Northwestern Ontario’s French-speaking professional networks. We encourage organizations, institutions and agencies that offer services and/or programs in French and for Francophone people to contact us for partnership opportunities. Coopérative ROFTB Inc. can participate through various ways including financial help. For enquiries please contact the program manager Claire Thiébaut at (807)-684-1965 ext. 100 or gestionnaire@centrefranco.ca.